It was 1978. Or was it '79? I was in my first Broadway musical -- On The Twentieth Century. I don’t remember exactly, but about 6 months into the run there was a knock on my dressing room door at the end of a performance. I opened the door and a young couple introduced themselves to me. His name was Michael Zilkha and hers was Cristina Monet. They seemed very nice. I asked Cristina if she was by any chance related to Claude Monet. As I recall, she said that he was her great granduncle or some such. Cristina told me that she was a singer, and Michael her producer. They were working on a song in which they would like me to perform with her. They said it would be a narration, reminiscent in style of Kurt Weill and Bertolt Brecht. As I recall, they said they would pay me $5000 for my services (which seemed like quite a lot), that I could come over to their recording studio after a performance and it would only take an hour or so. They gave me a rough outline of the song and handed me the script. I was to assume the role of a sort of loopy disco lothario. At the time, I was rather snobbish in my musical tastes, didn't really go to discos, didn’t care for most disco music, wasn’t interested, and consequently knew next to nothing about the genre. I have subsequently come to appreciate it much more. Notwithstanding all that (or perhaps because of it) I thought -- Sure, why not? $5000 for an hour's work and it’ll be a break from the long run of the same show every night. Ignorant as I was, how could it help but be a learning experience? A few nights later I went to the recording studio after a performance. When I arrived, they explained that they had laid down something like 48 tracks for the song and were very excited about that. Not knowing that 48 tracks was an impressive amount, but seeing that they were excited, I said "Wow." They played the song for me, and I was indeed impressed by the orchestration -- the big, multi-layered, cleanly and sharply produced sound, and of course the inexorable throbbing beat. Cristina's vocal tracks had already been recorded, so all I had to do was recite this narrative. Her breathy, plaintive tone, earnest and sweet and clueless, seemed perfect. It was fun, absurdly humorous and nicely tongue-in-cheek. We did a few takes, tried a few different versions. I was no Isaac Hayes, but I thought I sounded appropriately lubricious and pretentious, and they both seemed pleased. Then they asked for some unscripted sexual mutterings and moanings with Cristina in the style of "Je T'aime... Moi Non Plus." I obliged. I had told them up front that I did not want to be credited on the record, which they were fine with. My professional acting career was in its infancy, and as disco narration was part of neither my métier nor expertise I thought the better part of venality was discretion. They asked me if I could come up with an ad hoc pseudonym, and I gave them "Peter Abbott," thinking that when said quickly it would sound like "Peter Rabbit." They wrote me a check, and I was on my way. Some time later, a copy of the record was dropped off for me at the theater. The entire enterprise was a brief, amusing parenthesis, and I pretty much forgot about it and went on with my life. I suppose you could say it came back to “haunt” me some years later when I was a guest on David Letterman's show and they played a bit of it in a futile attempt to embarrass me. They told me up front that they would like to play it if it was all right with me, and I said it was. If I acted embarrassed when they did play it, it was only out of a youthful eagerness to please and play along. I don’t embarass easily, as my body of work clearly attests. 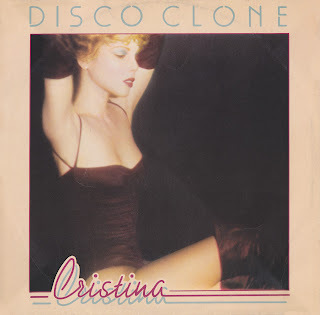 Who knows, future generations (assuming there will be any) may look on "Disco Clone" as my best work. Who am I to say?